Shake off the excesses of the festive season. You'll need to wrap up! The next winter event will be 11/12 January 2020. Entry will open Friday 1st November 2019. Winter can be a fantastic time for bikepacking, obviously you need to be prepared but the promise of crisp air, frozen trails and clear night skies should be enough to encourage you to pack your bike and head out. 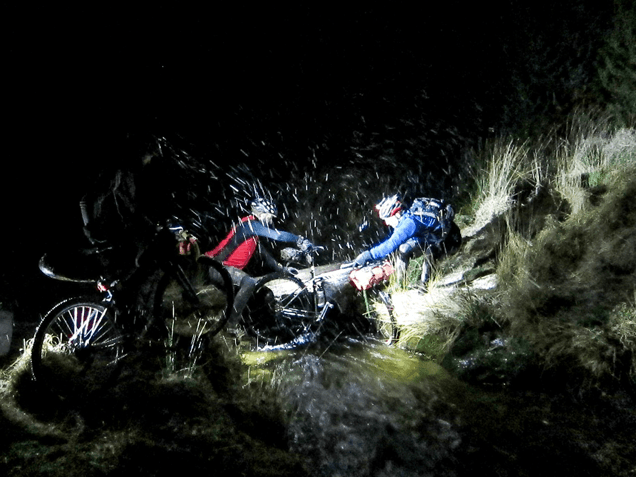 However, if you find that the potential delights of Winter haven't got quite enough draw to get you off the sofa, then hopefully the added incentive of the Bear Bones Bikepacking Winter Event will have. Just like the WRT, the winter event doesn't have a fixed route but unlike the WRT it does have a fixed destination(s) which gives each event its unique name … how you reach it is down to you. We'll give you a few grid references to point you in the right direction. To help set you up for your wintery adventure, the event starts from Llanbrynmair Community Centre, Powys SY19 7DH where you'll collect your Bear Bones Bikepacking goody pack and we'll ply you with tea and toast while you prepare for what's in store. Once you're ready, you can set off, there's no official start time … in fact you're free to get underway any time between 9.00am and 2.00pm. Sunday sees you return to the start, where you'll be greeted by a seemingly never ending supply of tea and cake while you defrost your digits and compare notes with other riders. You don't have to be back for any particular time, doors will be open from 9.00am onwards and will stay that way until the last rider's home which will hopefully be before 7pm!